A&T Systems is an Amazon Web Services (AWS) Advanced Consulting Partner and an Authorized Government Reseller Partner/Value Added Reseller with an AWS Letter of Supply for all AWS offerings, with a Small Business NAICS Code where beneficial. 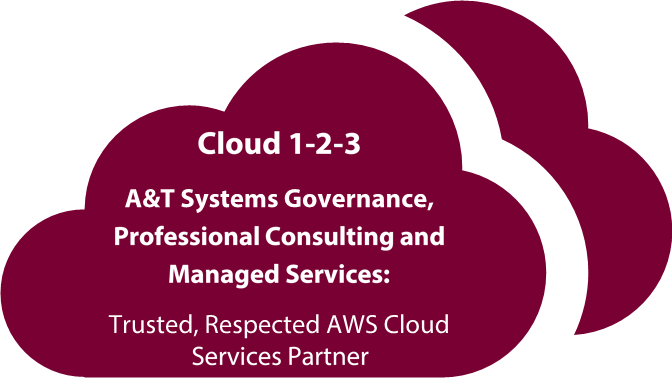 We also are an AWS Authorized Government Partner able to provision and manage deployments in the GovCloud region. Our partnership with Amazon, our extensive experience in providing Public Sector, Federal, State, local governments, position A&T to assist clients who need to select, acquire, establish, implement, and maintain secure, robust, scalable capabilities in the Cloud – Production or DevOps. Through our partnership with AWS, A&T offers a FedRAMP-Certified AWS Infrastructure as a Service (IaaS) as well as Platform as a Service (PaaS) and Software as a Service (SaaS) capabilities. A&T’s cloud architects, DevOps and technical support staff, billing experts, and project managers provide methods, services, and approaches to optimize the AWS pricing model and ever growing collection of AWS tools and features. A&T supports requirements for conducting discovery; architecture of redundant solutions; ensuring security compliance; seamless workload migrations; managing performance, and root cause problem identification and resolution; up-to-date knowledge of emerging developments and directions in cloud products and services. A&T has established simplified billi ng and invoicing processes that streamline how you pay for your services. A&T provides well-developed cost analysis, monitoring, and reporting capabilities that enable you and A&T to identify cost reductions and predict future spending. Our A&TVantagetm Governance Model helps agencies get a head start in developing their Governance models as they migrate from datacenter based IT infrastructure to the Cloud.